The Walking Group is a group of individuals who like to get out in the company of others and enjoy the sights and sounds of nature. All walks are held on trails in and around Aurora and vary from week to week. The terrain may be hilly (as is much of Aurora) and participants should wear appropriate clothing and footwear. 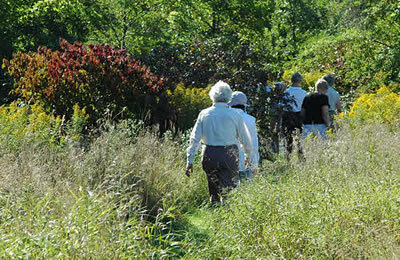 Walks are held on Wednesday mornings and are about an hour in length walking at a comfortable (not strolling) pace. We meet each week by 9:30 am at the Seniors Centre and car pool to the starting location, if necessary. We are usually back at the Centre by about 11:00 am. Although we walk throughout the year, walks may be cancelled due to bad weather (heavy rain or snow) or unsafe trail (icy) conditions. Please call the Reception desk at the Centre (905-726-4767) on the morning of the walk if you are unsure about the walk taking place. No pre-registration is required, just show up. We are always looking for eager members to walk with us, so come out and give us a try! Monthly Indoor Walking Group – NEW! Once a month at the Aurora Family Leisure Complex (AFLC), we host a FREE walking club on the indoor walking track. All fitness levels are welcome. Participants walk from 10:00-10:15 a.m., we have a group stretch at 10:15, and at 10:30 there will be a healthy-living seminar. Participants are welcome to keep walking after the seminar. See our calendar for scheduled days and times. The Aurora Seniors Centre is operated in partnership with the Town of Aurora's Community Services Department. Its success is based on the Seniors who volunteer their time and Town of Aurora staff. Our goal is to provide programs, events and activities that will benefit and enrich the lives of older adults. Our wonderful Mahjongg groups meets on Mondays and Thursdays and always have lots of fun! They are excited for spring and may get to play on our deck when the weather gets nicer! Copyright © 2018 Aurora Seniors Association. All rights reserved. Website by Crimson Leaf Studios.